Street Psalms is a missional non-profit with a focus on urban environments. They have several “hubs” around the world where they train individuals to become incarnational leaders who live among the people they serve. To share their years of research and experience, they wrote an extensive document called the Incarnational Training Framework. They needed a way to distribute this information quickly and easily, so we designed them an ebook that could be downloaded by their partners across the globe. The people at Street Psalms are practical, on-the-ground activists but they are also dedicated scholars. The design needed to be approachable while still reflecting the careful thought and research that went into the text. While we often design text to be skimmed, this particular text was meant to be dug into and thought deeply about. To make the reading experience as pleasant as possible, we provided generous margins and leading. We also took inspiration from textbook design with color-coded units and pull quotes to illuminate important ideas. Because the ebook was rather text-heavy, we wanted to provide readers with a bit of a visual and mental break. The authors had chosen a poem to accompany each chapter and we decided to isolate these on their own page to set the tone for the content to follow. This is a space to slow down and reflect. The minimal layout also allowed certain design elements to really shine. 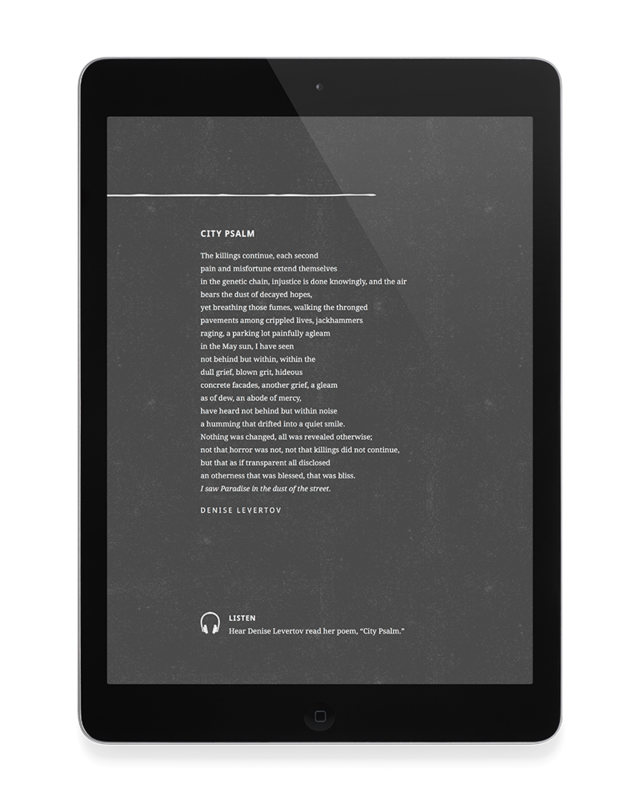 The ragged line and concrete texture that are used more minimally throughout the rest of the ebook take center stage here—illustrating the gritty and imperfect nature of the city and of humanity. Street Psalms believes in educating the “head, heart and hands of urban leaders.” Because this was an ebook, we were able to incorporate this into the training by including interactive elements that engaged the senses as well as the mind. 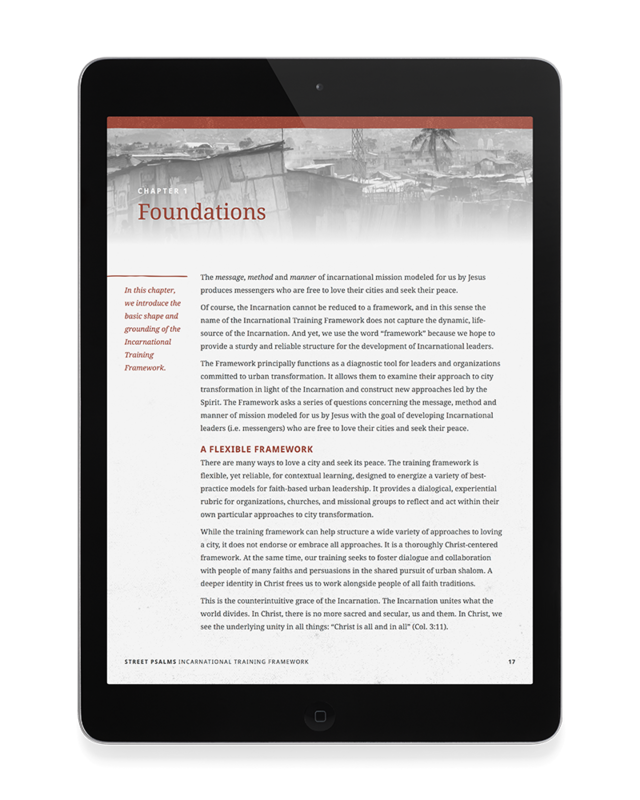 These “Digging Deeper” sections feature additional resources hand-picked by the authors to accompany the text. Readers can click on the icons and immediately be taken to content that recontextualizes what they’ve already learned. 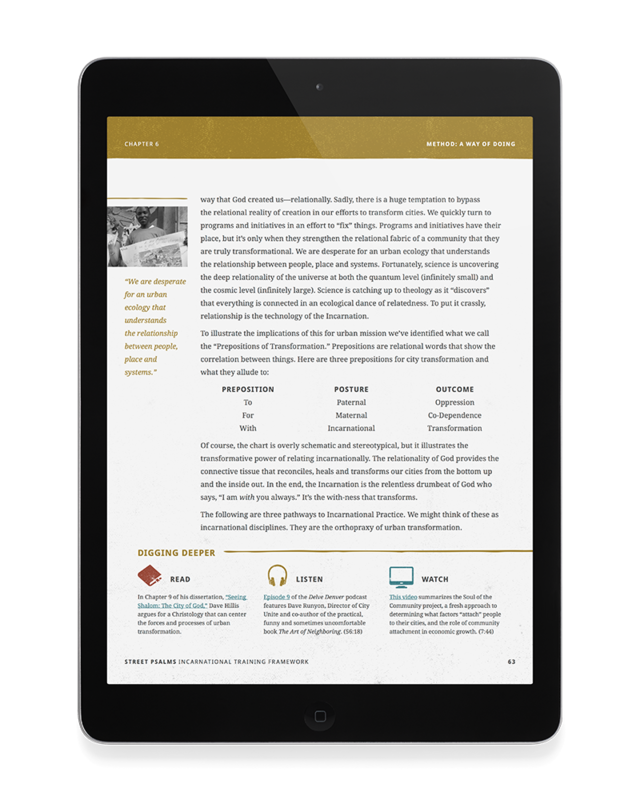 In addition to an interactive document that could be read on a computer or tablet, we also designed a version that could be downloaded onto a Kindle or other e-reader. The Incarnational Training Framework is currently undergoing edits for version two, making it a living document as changeable as the city itself.